A CHANCE to showcase the old and the new Spearwood with her mentor and father was enough reason for Shannah Mitchell to take part in the City of Cockburn’s Show Off 14 Exhibition. Shannah and father Larry are among eight family pairings of the 64 invited exhibitors and 150 works that will be on display at the exhibition at Memorial Hall from April 14. Ms Mitchell, who grew up in the area, said she was excited to exhibit with her father, a long-time painter and Spearwood local. 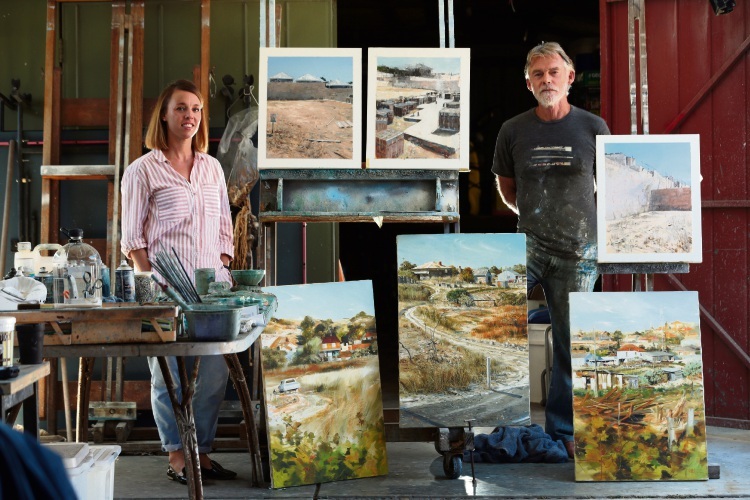 “Dad’s were painted at the time depicting old Spearwood and he pulled them out and I’ve painted construction sites and development of today,” she said. “I’m attracted to that grungy type urbanist style, but what made me want to do this area is because it’s where I grew up. The 39-year-old mother of three said taking part in the exhibition was a special experience for the duo who were able to spend time together, connect and reminisce about the past. “I love that area,” she said. “Aesthetically, when I was travelling through Europe in my 20s there was something that reminded me of home. “I’ve always thought it was beautiful and there’s nothing wrong with development but I always feel nostalgic about the area. “It’s nice to be connected to my dad in that kind of way and growing up you didn’t appreciate his help, which is so silly. The Mitchells will be joined by Nis and Danika Wichtermann, Tiffany and Migara Ramanayke, George Haynes and Jane Martin, Jon Denaro and Bec Juniper, Terry Stone and Frances Myshell, Trevor and Ruth Vickers and Miles Carpenter and Carol Richards. Most of the works will be for sale.